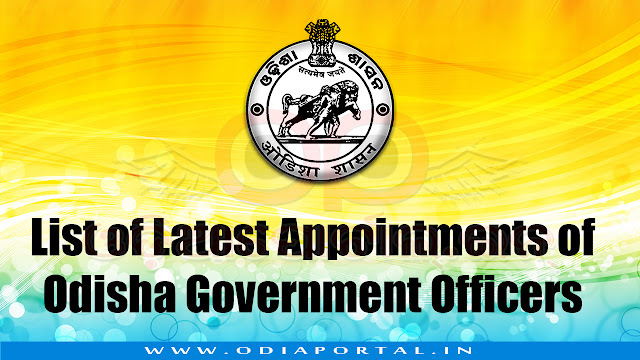 The following is a collection of Latest Appointments of Odisha Government Officers such as IAS Cadre, OAS Cadre and other major posts and appointments. Feel free to contribute if we miss something. Post/Dept: Deputy Secretary in Water Resources Department. Chairman, Odisha Hydro Power Corporation Ltd. (OHPC). Additional charge of Secretary of Board of Revenue. Vice-Chairman, Rourkela Development Authority, Rourkela. NOTE: Her Previous appointment as State Project Director, OPEPA, State project director, RMSA and Director Odisha Adarsha Vidyalaya Sangathan has been cancelled. NOTE: Her appointment as Mission Director, National Health Mission has been canceled on 16th Jan, 2018 after IAS reshuffle. Post/Dept: Director, Agriculture Marketing and Member Secretary, Odisha Agricultural Marketing Board. Additional charge of Commissioner, Food Safety. Post/Dept: Registrar, Cooperative Societies, Odisha. Post/Dept: Additional Secretary of Commerce & Transport department. Post/Dept: Joint Secretary of Science and Technology department. Additional charge of Mission Director, Swachha Bharat Mission (Urban). Post/Dept: Director, Small Savings, Finance department.